On December 5, 2018, the Pittsburgh Section Younger Members Forum (YMF) held their annual December Dinner event at Phipps Conservatory and Botanical Gardens in Pittsburgh, PA. Of the 62 members and non-members in attendance 11 students were students. The evening began with a networking hour featuring free professional level headshots. Quality, up-to-date headshots are often undervalued or forgotten by some professionals. However, in this age of information sharing and telecommunication having a polished and professional headshot on-hand makes a good impression; be it within a statement of interest, job application, or award nomination. Dinner followed the networking hour allowing time for more in depth connections to be formed. Catherine Bazan-Arias began the presentation part of the evening with an introduction to “Engineering Pittsburgh: A History of Roads, Rails, Canals, Bridges and More”, an ASCE Pittsburgh Section publication written by 16 professionals to celebrate the 100th Anniversary of the formation of the ASCE section in Pittsburgh. Ms. Bazan-Arias spoke about the challenges and great rewards that come from undertaking a publication of this type. Without the tools of email, teleconferencing, and other information sharing approaches this project that required the coordination of 16 authors likely would not have been accomplished within the 2 year schedule. Learning how to appropriately use these tools is important to advancing one’s career and the civil engineering profession as a whole. Following Ms. Bazan-Arias introduction, we were fortunate enough to have two of the 16 authors give a summary of their individual chapters. Sam Shamsi began by speaking on the history and progression of the wastewater collection, conveyance, and treatment in the Allegheny County. The first public drinking water system in Pittsburgh began in 1802. In the 1950s Allegheny County Sanitary Authority (ALCOSAN) wastewater treatment plant was constructed as part of the “Pittsburgh Renaissance”. Now ALCONSAN and Pittsburgh Water and Sewer Authority (PSWA) are challenging the traditional wastewater infrastructure of pipes, pumps, and storage tanks by supporting sustainable projects that include rain gardens, green roofs, and porous pavement. Todd Wilson then shared several before and after pictures of bridges and intersections familiar to the downtown Pittsburgh and Oakland landscape. He explained that some of the odd intersection configurations or topography around Pittsburgh resulted from the previous existence of a bridge or industrial route. He gave tips on how to spot areas where an old bridge has been filled in and/or buried to allow new development on flat ground. After the presentations, attendees had the opportunity to enjoy the grounds of the beautiful and historic Phipps Conservatory and Botanical Gardens, including the winter garden and light show display. Donations of toys for school age children were collected and gifted to The Brashear Association. The ASCE YMF leaders fervently thank all those who sponsored the event. Our sponsors’ generosity allow the YMF to provide these great networking and learning opportunities to college students and young professionals. Thank you for investing in the future of the civil engineering industry! On Wednesday March 6th, 2019 ASCE Pittsburgh will be hosting it's 10th edition of its Sustainability Conference. This year's theme is Smart Cities: Transforming Cities to a New Era. When you ask a regular citizen what first pops into their head when they hear the words "smart technology" or "artificial intelligence", the answer you will likely hear back is "driverless vehicles" or "Uber". Autonomous vehicles have certainly grabbed most of the attention recently in the headlines, especially after the tragic accident in Arizona last year. Admittedly, autonomous vehicles themselves are attention grabbing and are prominently visible when seen on the roads. Nowhere is this more evident than right here in Pittsburgh being one of the leading test beds on the planet for their development. But underneath the surface, "smart technology" goes much deeper than just transportation applications. Entire city operations are beginning to find ways to incorporate smart technology that rely on thousands of sensors and artificial intelligence driven computing power. Cities (and even Nations) are considering it a race to become the "smartest" and most technologically advanced as way to attract investors and drive economic growth. Needless to say, "smart city" is not some throwaway buzz word catchphrase. This is real and forecasted future investment in 2021 is expected to hit $135 billion. Yes, that's with a B.
I ask that you read (or at least skim) the articles linked above. It will provide you an idea of why this topic is so important and why you as a civil engineer should begin to prepare yourself for this changing future or prepare to be left behind. The implications of these technologies are across all civil engineering disciplines and every engineer will likely need to adapt in some fashion. You may be asking yourself what does "smart cities" have to do with "sustainability"? And the simple answer is people and efficiency. Research is showing that smart technologies are connecting people in new innovative ways and resulting in more efficient energy systems, more efficient water usage, more efficient waste management, more efficient traffic control, more efficient structural assessments. Increased efficiency means reduced pollution and fewer carbon emissions. During this year's conference we are going to be exploring these technologies with leading experts and learn how smart technologies are at the beginning stages of impacting the Pittsburgh region. ASCE Pittsburgh is once again partnering with Sustainable Pittsburgh and the City of Pittsburgh Mayor Peduto's office. We are also bringing in as a partner Carnegie Mellon's Metro21: Smart Cities Institute, one of the leading research institutes in the world on this highly evolving subject. You as an engineer should consider registering and attending the conference to learn about how your profession is on the brink of experiencing a revolutionary sea change in the very near future. 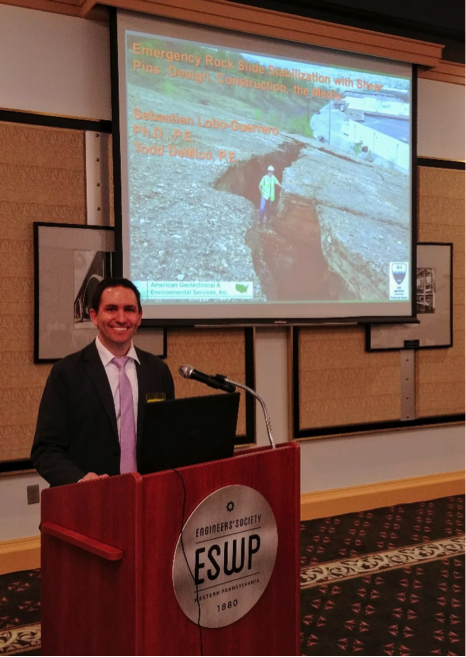 The Pittsburgh Geo Institute Chapter opened the 2018-2019 program year on September 27th at ESWP with the presentation “Emergency Rock Slide Stabilization with Shear Pins: Design, Construction, the Media” by Sebastian Lobo-Guerrero, Ph.D. P.E. The presentation covered the emergency response to stabilize a massive rock slide in Central Pennsylvania that was endangering a shopping plaza, a gas line, and electrical utilities located at its toe. The potential impact to these features made quick action to fix the slide critical. Due to the threat, the project received significant media attention that played both a positive and negative role in the project. The permanent remediation of the landslide involved the design and construction of shear pins (uncased micropiles). The remediation involved partial top down excavation of the landslide. This excavation removed the top portion of the landslide mass to unload the slope. The material removed was used to construct a buttress to provide temporary support of the slope until shear pins could be installed. The shear pins were installed to cut off the landslide slip plane. The presenter, Sebastian Lobo-Guerrero Ph.D., P.E., is currently a project manager and laboratory manager at American Geotechnical and Environmental Services’s (A.G.E.S.) Pittsburgh, PA headquarters. Sebastian has more than 16 years of experience as a geotechnical engineer and has authored more than 40 technical papers published in scientific journals, geotechnical magazines, and conference proceedings worldwide. He is a former chair of the Pittsburgh G-I chapter, and a former Director of the ASCE Pittsburgh Section. In addition to the technical presentation, the incoming G-I Chapter Chair, Greg Braun, P.E., introduced the 2018-2019 Pittsburgh G-I Chapter board members and highlighted the program year. The Geo Institute’s new board members along with upcoming G-I dinner meetings can be viewed on the Chapter’s webpage. On the evening of September 22, as I was celebrating ASCE-Pittsburgh’s 100th Anniversary at the beautiful Hotel Manco in downtown Pittsburgh, my mind was contemplating a safe time to depart for another important ASCE event in Reston, Virginia. I wanted to have sufficient time to rest but not miss a 10 A.M. round-table discussion on the potential challenges faced by incoming Section Presidents. I ended up resting for five hours before a 5 AM departure for ASCE PGF 2018. On September 23-24, 2018, 103 Section and Branch Presidents, Region Governors and Society Directors from across the country and abroad attended the annual Presidents and Governors Forum (PGF) in Reston, VA at ASCE Headquarters. This event was organized and moderated by the Leader Training Committee (LTC) and provided opportunities for attendees to learn about ASCE resources, network with other ASCE leaders, and gain useful training that would benefit their Sections and Branches. The purpose of the PGF is to provide a venue for current Section/Branch President-Elects and Region Leaders to gain the knowledge to effectively and efficiently run their local units. The conference provides an opportunity for attendees to network and brainstorm with each other, gain leadership skills, learn about ASCE resources from other ASCE volunteers and staff and discuss Best Practices to take back to your Section/Branch. Networking receptions were held on both Saturday and Sunday, with a group dinner on Sunday attended by most of the conference attendees. On Sunday, topics included an Introduction to your Presidency and How to Utilize your Governors; an Introduction to Region 10; Roundtable Discussions on Section and Branch Challenges; and How to Be A Great Leader at Work and in ASCE. Seasoned ASCE leaders spoke about their experiences with Social Media and Student Transition Activities in their Section and Branch. President Kristina Swallow, President-Elect Robin Kemper, and Executive Director Tom Smith also shared their thoughts and experiences. Monday continued with additional Best Practice sessions on Struggling Sections and Branches, Developing a State Infrastructure Report Card, Attracting Younger Members through Diversity Programs, Student Transition, and Successful Section and Branch Operations. The program continued with a presentation on Legal issues for Sections and Branches and an update on Dream Big, followed by a competitive game of JeopardASCE. Closing remarks were made by President-Elect Elect Kancheepuram Gunalan (Guna). My favorite part of the meeting was a guided tour of rather modest Headquarters building. I downloaded the GroupMe Social Media App for event announcements but was eventually annoyed by the large number of notifications as other members were joining or leaving the group. 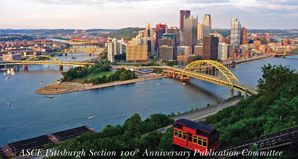 I showed our hot off the press 100th Anniversary “Engineering Pittsburgh” book to organizers and attendees and was asked to submit a report for the section/Branch Best Practices Guide. After two solid days spent with ASCE, I left with some new knowledge that will help me next year as the ASCE-Pittsburgh Section President. I gained a better understanding of the National resources available to the Section. I think this meeting should be mandatory for all incoming Branch and Section Presidents and Region Governors. ASCE President, Kristina L. Swallow, P.E., ENV SP, F.ASCE was in Pittsburgh on the night of September 22 to join our 100th Anniversary celebrations. Like me, she too had to be in ASCE Headquarters next morning for PGF 2018. I arrived before her despite the fact she took a flight whereas I drove. I promise I was not speeding! For more information about the PGF, please visit LTC’s new website. 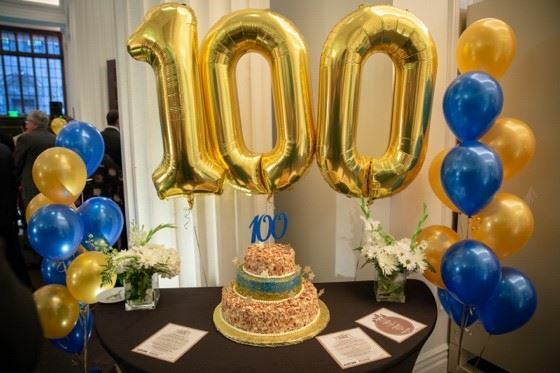 After two years of planning, and more than a century in the making, the Pittsburgh Section of ASCE held its once-in-a-lifetime 100th anniversary celebration event at the Hotel Monaco on Saturday, September 22, 2018. 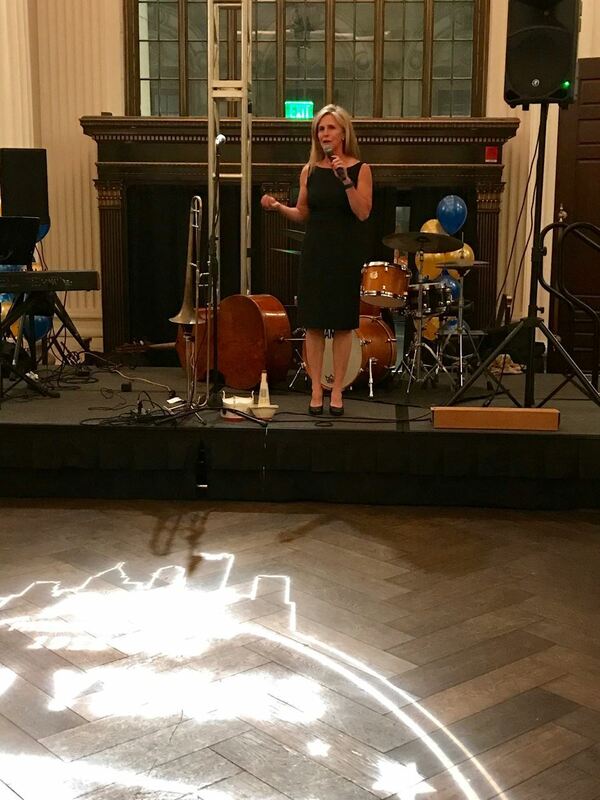 With almost 200 members and guests in attendance, Section past president Pat Sullivan kept the crowd engaged as Master of Ceremonies as everyone enjoyed entertainment by Pittsburgh’s Boilermaker Jazz Band and outstanding food stations provided by The Commoner. The party featured a special social media hashtag, “#ascepgh100”, and a centennial book launch and book signing by the civil engineers and professionals that co-authored the Section’s 2018 commemorative anniversary publication, “Engineering Pittsburgh: A History of Roads, Rails, Canals, Bridges & More”. The publication aims to record some of southwestern Pennsylvania’s engineering and infrastructure challenges and triumphs. 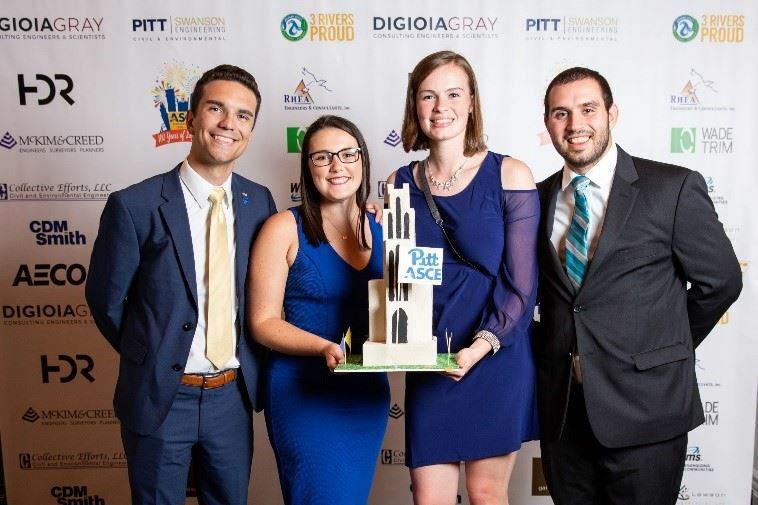 Memorable moments included a Proclamation by the Mayor of the City of Pittsburgh William Peduto, and remarks from current ASCE National President Kristina Swallow and former ASCE National President Andrew Herrmann. Pittsburgh Section Past Presidents and Life Members were also acknowledged for their contributions to the growth, achievements and award-winning standing of the Section. The section was further pleased to thank all of the celebration sponsors by presenting each of them with a commemorative plaque. The entire crowd joined in singing “Happy Birthday” as Section President Robert Dengler and National President Swallow cut the custom cake creation from the legendary Prantl’s Bakery. This joyous moment was followed by a “Celebration Selfie” – a group photo with as many party goers as could fit! Attendees had the unique opportunity to contribute historic photos, articles, small instruments or devices, videos, books, letters to the future leadership of ASCE, along with engineering “doodads or trinkets” to be placed in a special 100th anniversary time capsule. The capsule will be sealed and stored at the Engineer’s Society of Western Pennsylvania (ESWP) to be re-opened at the 200th ASCE Pittsburgh Section Celebration in 2118. The 100th Celebration Subcommittee also held a centerpiece design competition among the Section’s Institutes, Committees, YMF and Student Chapters. The winning centerpiece was selected by our gala guests’ popular vote and the winning design was that created by the University of Pittsburgh Main Campus (Pitt) Student Chapter. The ambassadors of the Pitt Student Chapter received a $500 prize sponsored by the Section. Guests were further treated to a 50/50 raffle and door prizes provided by local firms AECOM, DiGioia Gray, and Williams. 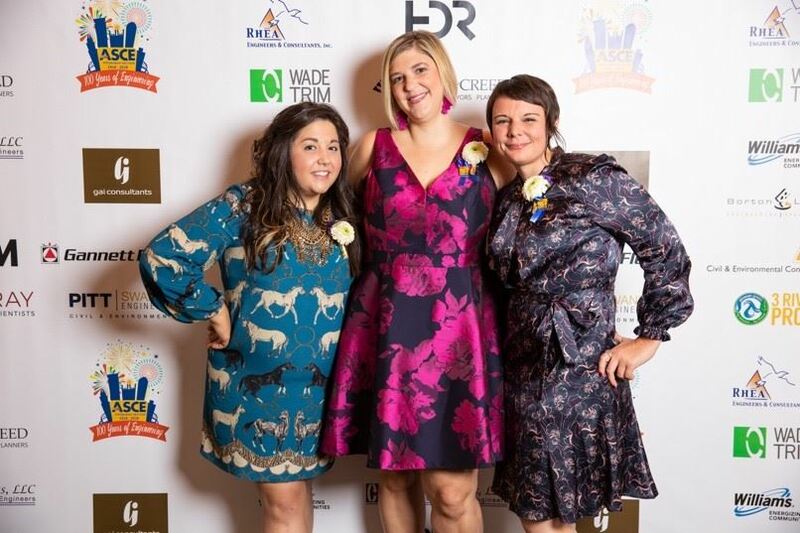 Special recognition was given during the event to the 100th Celebration Subcommittee dynamic trio who gave their time, experience and boundless energy to plan, manage and execute the massive undertaking and made the evening a success: Lauren E. Terpak, Angela Mayer, and Sara Mullaney. *Thank you*, ladies! Our Section is duly grateful to each person who contributed to the event’s success: a night to remember- 100 years from now! The fourth annual “Imagine a Day Without Water” water awareness day took place on Wednesday, October 10, 2018. The Environmental and Water Resources Institute of the American Society of Civil Engineers, Pittsburgh Section, once again joined the effort to raise awareness about how water is essential, invaluable, and worthy of investment. The Pittsburgh region has been experiencing above average high-intensity rainfall events, so it may be difficult to imagine a day without water. Though our region may be water rich, we are using more water than we think, albeit indirectly. 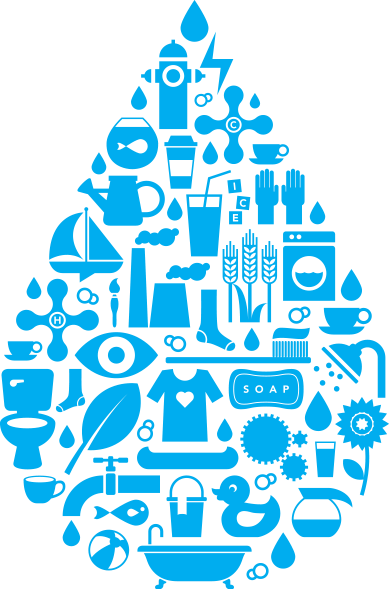 We consume water from all over the country and the world through the products and services we use. A standard (1.5 oz) chocolate bar requires on average 197 gallons of water to produce; a large egg requires around 52 gallons of water, and 1 lb of beef requires on average 1,847 gallons of water. [1, 2] In fact, an average American uses 750 thousand gallons of water as part of the goods and services consumed over a year, and, of the water we consume, 20% comes from products produced outside the U.S.A., mainly China. Imaging a day without water can be difficult in Pittsburgh due to more frequent, intense rainfall events, but it is essential to recognize our reliance on water outside of this region. We are indeed connected to the world through the products we consume and should be conscious of the fact that the places that produce these goods face water scarcity. Next time you buy a product, look at the packaging to see where it's coming from. Doing so may help to reduce over-consumption and waste of water. 1. Mekonnen, M.M. and A.Y. Hoekstra, The green, blue and grey water footprint of crops and derived crop products. Hydrology and Earth System Sciences, 2011. 15(5): p. 1577-1600. 2. Mekonnen, M. and A. Hoekstra, The green, blue and grey water footprint of farm animals and animal products. 2010. 3. Mekonnen, M. and A.Y. Hoekstra, National water footprint accounts: the green, blue and grey water footprint of production and consumption. 2011. Since the Pittsburgh Section was founded a hundred years ago, in 1918, our membership has grown to nearly 1,500 members and our members have accrued multiple notable achievements, experiences, and awards. The Section has a strong commitment to the advancement of civil engineers, which is demonstrated through organization of professional development opportunities to recognizing outstanding achievements of area civil engineers. ASCE Pittsburgh throughout the century has a longstanding history of fostering the growth of civil engineers while celebrating their successes. During this centennial year, the Section is going to further focus on celebrating civil engineering accomplishments in one evening. This event will be occurring on September 22nd at Hotel Monaco to celebrate the Section’s 100 years of history. The occasion will start at 5:30pm and last throughout the evening till 10:00pm. Attendees will also have the opportunity to take home a little bit of history in the form of a table book “Engineering Pittsburgh” that features memorable civil engineering projects from the region’s past. The 100th Celebration Committee aims to further capture these outstanding moments in time and place them into the “ASCE Pittsburgh Section Centennial Time Capsule” which will be presented at our Centennial Celebration on Saturday, September 22, 2018 at Hotel Monaco. Thus, our committee is asking all members to donate historic photos, notable articles, small instruments/devices, videos, books, letters to the future leadership of ASCE, etc. along with engineering doodads or trinkets. The donated items will be collected during the event and will be displayed throughout the evening. After the event, a blog article will be posted on the Pittsburgh Section website with a brief description of the collected items alongside photographs. 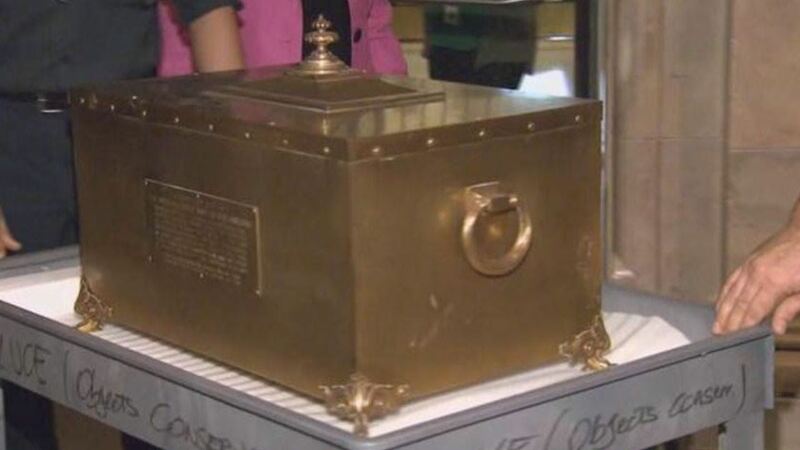 The items will then be placed in the “ASCE Pittsburgh Section Centennial Time Capsule” and sealed, to be re-opened at the 200th ASCE Pittsburgh Section Celebration in 2118. The “ASCE Pittsburgh Section Centennial Time Capsule” will reside in the basement of the Engineer’s Society of Western Pennsylvania (ESWP). A group photo will be taken during the 100th Celebration at 8:00pm; this photo will also be placed in the “ASCE Pittsburgh Section Centennial Time Capsule”. 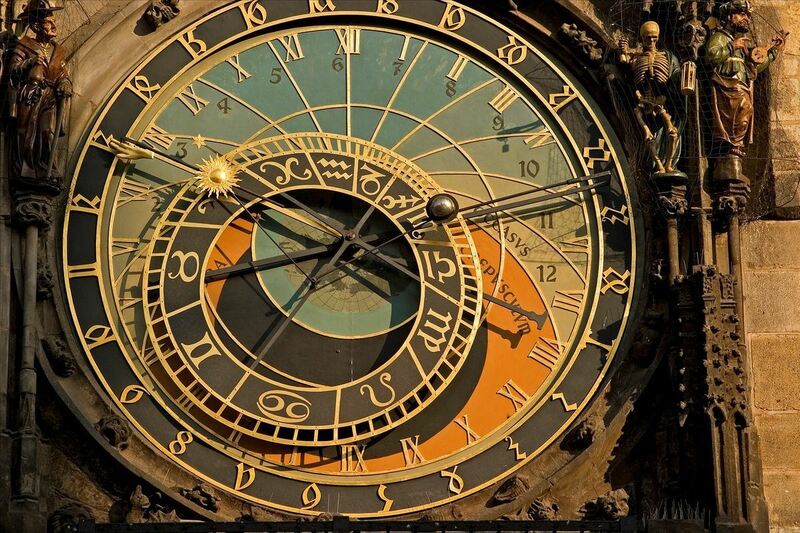 Take this once in a century opportunity to leave a piece of our history and present for the future! Increasing rainfall intensity in Southwestern Pennsylvania has brought stormwater management to the forefront of the public eye. As a result, Green Stormwater Infrastructure (GSI) has gained more attention as a cost-effective solution to help manage the impacts from wet weather. 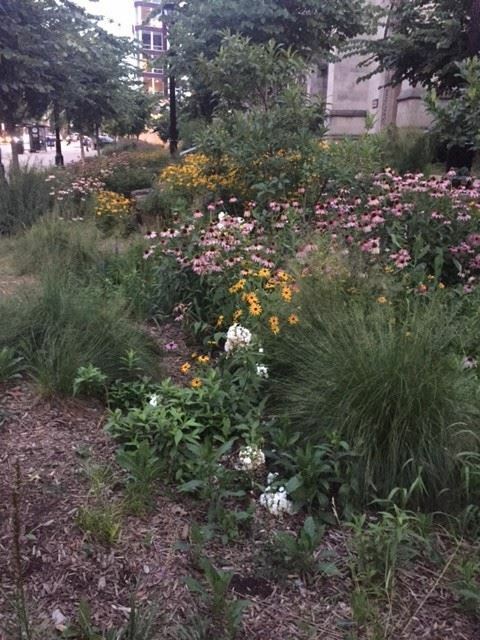 On July 26, 2018, the local Environmental Water Resource Institute (EWRI) Pittsburgh chapter partnered with representatives from the EWRI National Technical Councils to host an afternoon workshop on Urban Green Infrastructure. 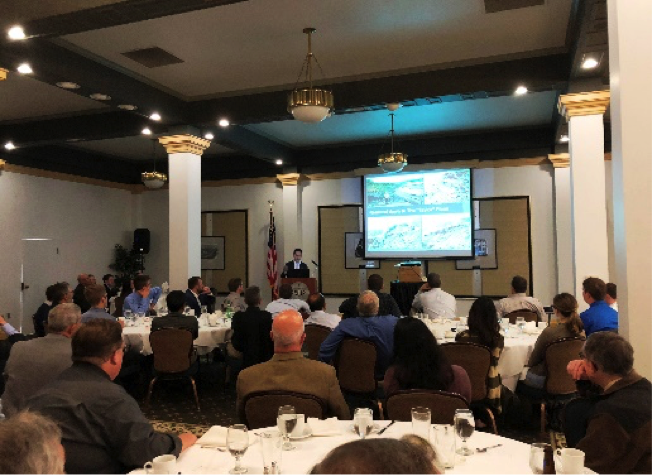 The workshop provided national and local expertise on Low Impact Development in combined sewer overflow (CSO) areas, operation and maintenance of Green Stormwater Infrastructure (GSI), and stormwater management in the ultra-urban environment. National and local speakers presented a variety of topics related to GSI, including pilot studies, funding mechanisms, research, and lessons learned. Speakers included Shirley Clark, Penn State University; Tim Prevost, Allegheny County Sanitary Authority (ALCOSAN); Barton Kirk, Ethos Collaborative; Matt Zambelli, MLZDesign; Ruth Hocker, City of Lancaster; Greg Scott, Buchart Horn, Inc; Ryan Quinn, Pittsburgh Sewer and Water Authority (PWSA); Rosanna LaPlante, City of Baltimore; and Jordan Fischbach, RAND Corporation. Shirley Clark (Penn State University) discussed numerous case studies of GSI in CSO areas across the U.S., including in Portland, Philadelphia, Kansas City, Seattle, and St. Louis. She emphasized that a combination of green and grey infrastructure is more cost effective than a grey only solution, even when co-benefits of GSI are excluded. She also highlighted that municipalities should focus on using public right-of-ways for GSI, rather than relying on private owners to maintain the infrastructure. Rosanna LaPlante (City of Baltimore) discussed the importance of public outreach and using the National GI Certification Program to train individuals that inspect and maintain GSI. Also, the City of Baltimore uses an urban waters interactive map to show locations of existing BMPs and identify locations where BMPs may not be as feasible due to existing conditions such as site soils, existing utilities, etc. Ruth Hocker (City of Lancaster) provided lessons learned from Lancaster’s stormwater program, which includes a stormwater fee, regulations of development at any scale, and the ability for residents to “Adopt a BMP.” According to Hocker, training and participation of field staff is a vital part of a successful GSI program. She recommended designing GSI with maintenance in mind, inspecting regularly, and using appropriate plant material by considering the effect of surrounding surface areas and localized pollutants like road salts. Adopting these recommendations may contribute to the success of GSI implementation nationwide. Barton Kirk (Ethos Collaborative) and Matt Zambelli (MLZDesign), professionals with experience in design, monitoring, and maintenance of GSI, provided an overview of several local GSI projects in Pittsburgh, including: bioswales, porous pavement, and street planters with an underdrain. Recent monitoring of a project at Oakwood and Batavia during a 10-year storm event (2.9 inches of rainfall over 11 hours) showed an infiltration rate of 7 inch/hour. Some of these projects are summarized on the Westmoreland Conservation District’s Interactive Best Management Practice (BMP) map. Greg Scott (Buchart Horn, Inc) discussed the design of a GSI project that will help address extensive flooding in the Shadyside neighborhood near Maryland Avenue in Pittsburgh. The ongoing project is a neighborhood-level stormwater project that uses an integrated design approach with several elements including new inlets and conveyance, green infrastructure, and underground storage. They are also evaluating the possibility of connecting residential downspouts to the integrated GSI system. Jordan Fischbach (RAND Corporation) presented a research study about “Robust Stormwater Management in the Pittsburgh Region,” which evaluated combinations of green and grey infrastructure to reduce combined sewer overflows under current and future conditions. RAND worked with ALCOSAN to simulate CSOs and analyze vulnerability of their existing system to future rainfall, population and land-use changes. Results emphasize the need to evaluate a range of uncertain, future changes to inform near-term stormwater and wastewater infrastructure investments. The full report is available on RAND’s website. The workshop also covered the importance of funding opportunities for GSI in Southwestern PA. Tim Prevost (ALCOSAN) discussed the GROW program, which awards grants to customer municipalities to implement stormwater reduction projects. The program, currently in its third cycle, has awarded 9 million dollars in project funding. Ryan Quinn (PWSA) emphasized prioritizing partnerships to fund GSI projects, referencing PWSA’s previous and ongoing partnerships with ALCOSAN, the Saw Mill Run Watershed Association, Pittsburgh Parks Conservancy, and neighborhood groups. This workshop provided a wide range of information about local and national GSI implementation in urban areas. Key take-aways included: (1) a combination of green and grey infrastructure is more cost-effective than grey only, (2) design of green infrastructure systems should be robust and adaptive (3) green infrastructure performance often exceeds expectations, (4) a dedicated maintenance team is vital for continued success, (5) GSI can help enhance resilience in cities that are susceptible to increases in extreme rainfall. The event was hosted at the Engineers Western Society of Pennsylvania in downtown Pittsburgh, PA in partnership with ALCOSAN, Allegheny County Conservation District, Allegheny Watershed Alliance, American Public Works Association, Nine Mile Run Watershed Association, PWSA, Saw Mill Run Watershed Association, Southwestern Pennsylvania Commission Water Resource Center, Stormworks, Westmoreland Conservation District, and 3 Rivers Wet Weather. 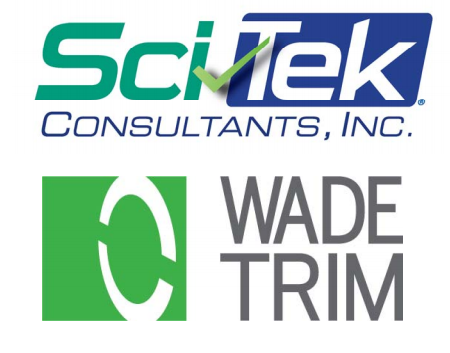 Thank you to these sponsors for helping make this workshop possible. EWRI Congress will be held in Pittsburgh on May 19-23, 2019. Abstracts are being accepted until September 10th.